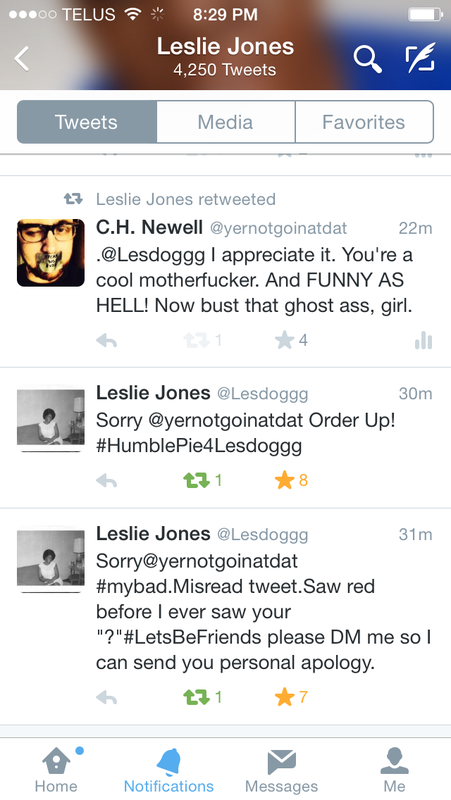 In my last post, re: Ghostbusters, I explained what happened on Twitter between Leslie Jones and I. Today, the blog blew up. Usually I get around 50-60 hits a day. It’s twice that already and still climbing. Well Ms. Jones read what I’d said, she followed me after unblocking me on Twitter, and then tweeted some apologies. Better yet – she and I had a great exchange via DM. I won’t go ahead and post our DM history, but I want to share one of her tweets to me. So when we had our brief conversation, Leslie was extremely cool, very humble. And even though I was angry yesterday as I typed with fury, raging because of this (minor) slight, I still knew that Ms. Jones, along with the other Ghostbusters ladies, have been seeing tons and tons of ignorant nonsense about the film. It’s understandable she could’ve quickly read my tweet, already pissed with so much negativity about, and preemptively jumped to a conclusion. Either way, Leslie was nice enough to take time out of her no doubt busy life & schedule to talk to me, and to extend a digital, friendly handshake of peace. I’m only one individual, yet the goodness in her heart took precedence and she made a point to talk with me and explain herself. She is a cool person, and I’m absolutely going to give her the second chance I wasn’t willing to give yesterday. Now if only the misogynists out there would get a life, but alas – a story for another day.